PITTSBURGH -- St. Louis coach Ken Hitchcock was offering the highest possible praise for a visiting player on Wednesday when Pittsburgh Penguins captain Sidney Crosby -- the subject of Hitchcock's monologue -- came walking by the Blues' dressing room. Hitchcock immediately halted his speech. There was old business to conduct. "Hey, you owe me $40!" Hitchcock said, and not seriously, as Crosby strolled by with father Troy Crosby at his side. "Why," Crosby said, more than suspiciously, as Hitchcock lobbied the Penguins star for some new footwear. "He's such a good player, such a good person. There's leaders, and then there's leaders of players. He gets along with the guys good. It's not surprising. Everything he does has got class to it. I just like the way he leads the guys." "Because my feet were wet at the (Olympic) ring ceremony," Hitchcock said. "And don't be giving me that (stuff) about 'Get the right guy.' "
Crosby, whose overtime goal decided Canada's thrilling 3-2 victory over the United States in the gold-medal game in the 2010 Vancouver Olympics, innocently contended he doesn't take part in such pranks because they lead to retribution. Hitchcock, an assistant on Canada coach Mike Babcock's staff, didn't believe it for a moment. "Forty bucks," Hitchcock said. "Hey, your room was right across the hall!" Hitchcock shouldn't be expecting a check in the mail from Crosby, not that it matters. To Hitchcock, all the cash in the world couldn't buy the leadership qualities that Crosby brought to a Canadian Olympic team that, under an inordinate amount of pressure to win on home ice, rallied from a slow start to win the gold medal. To Hitchcock, it was Crosby's leadership qualities that convinced the entire Canadian hockey team to live in the Olympic Village. 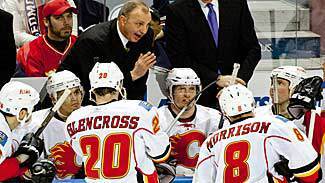 That move, Hitchcock said, was pivotal to a skilled group of highly-paid players from differing backgrounds and NHL organizations to pull together and become a team. Nobody needs to convince Hitchcock of Crosby's enormous talent, not all of it confined to his performance on a sheet of ice. He certainly didn't sound like the coach who, when he was with the Flyers, called Crosby a "diver" for going to the ice too often in an attempt to draw penalties. "By just his presence and his disposition, he just brought everybody into the Village," Hitchcock said. "It made a huge difference. Everybody was having fun together. You talk about building chemistry, the chemistry became instant. Everybody started hanging out on the (Village dormitory's) 12th floor and having fun together." In Vancouver, the Canadian team had the option of living in hotels outside of the college dorm-like Olympic Village, but Crosby's decision to move permanently into the Village convinced all of his teammates to do likewise. Hitchcock still remembers the scene after Canada was surprised by the United States 5-3 in a preliminary-round game, one that meant that any further losses would eliminate the home team. "It was 8 o'clock in the morning and we (the coaches) are going for breakfast and he's coming back with the whole crew," Hitchcock said. "It's just like the Pied Piper, everybody is following him back into the Village. … He was coming back with suitcases and there were about 10 guys following him." And a gold medal followed for Canada. "The coaches really appreciated that," Hitchcock said. "It made a huge difference." Just as Hitchcock expects Crosby to make a major difference with the Penguins, a team blessed with enough talent and depth that it led the overall Eastern Conference standings even before Crosby returned Monday from a 10-month concussion layoff. Hitchcock wasn't surprised at all when Crosby, playing his first game since Jan. 5, had 2 goals and 2 assists during a 5-0 Penguins victory over the Islanders on Monday. "He's such a good player, such a good person," Hitchcock said. "There's leaders, and then there's leaders of players. He gets along with the guys good. It's not surprising. Everything he does has got class to it. I just like the way he leads the guys." To further explain, Hitchcock added, "Some guys get it with their teammates. Some guys are leaders in the media and some guys are leaders with management or coaches or a combination. He just digs in with the players, he has fun with the guys. He led the fun parade in the Olympics, brought everybody back into the Village. … He connected everybody with the other athletes in the Village and made a huge difference for us moving forward."